Resveratrol (RES) is a natural polyphenolic non-flavonoid compound present in grapes, mulberries, peanuts, rhubarb and in several other plants. Numerous health effects have been related with its intake, such as anti-carcinogenic, anti-inflammatory and brain protective effects. The neuroprotective effects of RES in neurological diseases, such as Alzheimer’s (AD) and Parkinson’s (PD) diseases, are related to the protection of neurons against oxidative damage and toxicity, and to the prevention of apoptotic neuronal death. In brain cancer, RES induces cell apoptotic death and inhibits angiogenesis and tumor invasion. Despite its great potential as therapeutic agent for the treatment of several diseases, RES exhibits some limitations. It has poor water solubility and it is chemically instable, being degraded by isomerization once exposed to high temperatures, pH changes, UV light, or certain types of enzymes. Thus, RES has low bioavailability, limiting its biological and pharmacological benefits. To overcome these limitations, RES can be delivered by nanocarriers. This field of nanomedicine studies how the drug administration, pharmacokinetics, and pharmacodynamics are affected by the use of nanosized materials. The role of nanotechnology, in the prevention and treatment of neurological diseases, arises from the necessity to mask the physicochemical properties of therapeutic drugs to prolong the half-life and to be able to cross the blood–brain barrier (BBB). This can be achieved by encapsulating the drug in a nanoparticle (NP), which can be made of different kinds of materials. An increasing trend to encapsulate and direct RES to the brain has been observed. RES has been encapsulated in many different types of nanosystems, as liposomes, lipid and polymeric NPs. Furthermore, some of these nanocarriers have been modified with targeting molecules able to recognize the brain areas. Then, this article aims to overview the RES benefits and limitations in the treatment of neurological diseases, as the different nanotechnology strategies to overcome these limitations. Resveratrol (RES) is a natural non-flavonoid polyphenolic molecule found in several sources, such as fruits (i.e., grapes, mulberries, and peanuts), roots, grains, seeds, flowers, vegetables, and tea (i.e., rhubarb, green tea, and black tea) and wine (Berman et al., 2017). RES exhibits two geometrical isomers, cis- and trans-RES, being the last the biologically active form (Figure 1) (Wang and Chatterjee, 2017). Trans-RES can be converted into the cis-form after exposure to UV radiation (Yang et al., 2015). FIGURE 1. Chemical structure of cis- and trans- resveratrol. Numerous therapeutic effects have been associated with RES administration such as antioxidant, anti-inflammatory, anticarcinogenic, cardioprotective, and analgesic properties (Rauf et al., 2017). Thus, RES has been studied as therapeutic agent for cardiovascular disease, obesity, diabetes, and recently with an increasing relevance for the neurological disorders, including brain tumors (gliomas), Alzheimer’s (AD) and Parkinson (PD) diseases (Tellone et al., 2015; Martin, 2017; Rauf et al., 2018). Despite its huge potential as a therapeutic agent, the administration of RES faces several limitations. RES exhibits low bioavailability due to its short biological half-life, its rapid metabolism and clearance, and being chemically instable, highly photosensitive and poorly soluble in water (Francioso et al., 2014; Wang et al., 2017). Its low bioavailability hampers drug accumulation at necessary concentrations for successful therapy in target tissues (Berman et al., 2017). RES is quickly absorbed after reaching the bloodstream: it is metabolized in the liver and rapidly eliminated. Then, since the success of a neurological disorder therapy depends on a great extent on drug bioavailability, new strategies are required (Ghersi-Egea et al., 2009). A growing effort has been applied to overcome these issues and to find novel approaches for the treatment of neurological diseases with RES. Nanotechnology have been suggested as a suitable strategy for RES delivery to enhance its therapeutic activity (Summerlin et al., 2015). Through nanoencapsulation is possible to enhance RES bioavailability by increasing its solubility in water and preventing degradation. Nanoencapsulation will also allow decreasing RES toxicity in healthy tissues (Amri et al., 2012; Arora and Jaglan, 2017). In the last decade, several nanomaterials have been proposed as drug delivery systems (DDSs) (Peres et al., 2012; Khan et al., 2015; Ramalho et al., 2015a,b; Ramalho and Pereira, 2016). Each nanomaterial exhibits different biochemical and physicochemical properties and depending on the drug to be encapsulated and the disease to be treated, the most suitable nanomaterial should be selected based on its characteristics. In addition, biological barriers must be considered during the design and development of the chosen nanocarrier (Blanco et al., 2015). Among the existent biological barriers, the blood–brain barrier (BBB) is one of the main drawbacks for brain delivery. This barrier consists on a monolayer of capillary endothelial cells that block the path of over 98% of small-molecule drugs and 100% of large-molecule (>500 Da) (Cardoso et al., 2010), protecting the brain microenvironment from toxic substances present in the bloodstream, but allowing the transport of nutrients (Groothuis, 2000; Liebner et al., 2011). Thus, BBB hinders the development of novel therapies for brain disorders (Pardridge, 2009; Loureiro et al., 2014b; Bhowmik et al., 2015). The capability of nanosystems to cross the BBB depends on their physicochemical properties, and therefore nanocarriers must meet several requirements as being non-toxic, able to carry the desired drug and able to interact with receptors present at the BBB (Chen and Liu, 2012; Masserini, 2013). Some authors were able to develop efficient nanosystems for the encapsulation of RES and its delivery to the brain tissue (Hao et al., 2016; Ethemoglu et al., 2017; Trotta et al., 2018). Several studies prove that modification of the surface of the nanosystem can enhance the transport across this barrier (Loureiro et al., 2013a, 2015a; Neves et al., 2016; Shen et al., 2018). The modifications strategies can be based on attaching to the nanomaterial surface different moieties that improve the recognition of the nanoparticle (NP) by the BBB receptors (Loureiro et al., 2015b, 2016; Li et al., 2017). As mentioned above, a growing number of studies have focused on the treatment of several neurological diseases with RES encapsulated in NPs. This review will focus on RES therapeutic mechanisms in the prevention and treatment of glioma tumors, AD and PD, and nanotechnology-based strategies for its use in these diseases. The incidence of AD is related with the age. Affecting around 35 million of people in the world, AD is the most common form of dementia (Brookmeyer et al., 2007). This disease is progressive and induces memory injury and language, cognitive deficiency and behavior modifications. The neuropathological characteristics of AD are the extracellular senile plaques and neurofibrillary tangles (NFTs), composed by deposits of amyloid-beta peptide (Aβ) and by hyperphosphorylation and abnormal deposition of tau protein, respectively (Selkoe, 2001; Klafki et al., 2006). The Aβ aggregation induces the formation of insoluble fibrils, which accumulate in senile plaques (Clippingdale et al., 2001; Selkoe, 2001; Klafki et al., 2006; Rocha et al., 2012; Loureiro et al., 2013b). This process results from the imbalance between Aβ production and its clearance, that plays a crucial function in the AD progress (Hardy and Selkoe, 2002; Ahn et al., 2007). Insoluble fibrillar protein aggregates are considered a pathological feature of AD. Several tools have been studied to prevent and treat this disease (Loureiro et al., 2012, 2014a; Gomes et al., 2015; Carneiro et al., 2017). Therefore, it is indispensable to find drugs that prevent or inhibit the Aβ aggregation (Ahn et al., 2007; Ramalho et al., 2015b). Thus, RES has aroused a great interest in the scientific community to prevent and treat the AD, as will be discussed below. The beneficial effects of RES in AD have been studied in recent years, in in vitro as well as in vivo assays. This section describes the several mechanisms of action of RES on AD as presented in Figure 2. FIGURE 2. Schematic representation of RES pharmacological activities on AD therapy. Oxidative stress has been related with AD pathogenesis. Some products of oxidative stress, such as reactive oxygen species (ROS), interact with proteins, nucleic acids, and membrane polyunsaturated fatty acids. This causes lipid oxidation, decrease of membrane integrity and augmented permeability to Ca2+ in plasma membrane (Abolfathi et al., 2012; Li et al., 2012), which in turn favors the connection between nuclear factor kappa B (NF-κB) and specific regions of DNA, that promotes cell and tissue injuries leading to cell death (Draczynska-Lusiak et al., 1998; Ahmed et al., 2017). The therapeutic effects of RES are related to its antioxidant activity (Rege et al., 2014; Ahmed et al., 2017). Some authors observed that RES has protective activity in PC12 cells through the prevention of NF-κB activation, inhibiting the apoptosis (Jang and Surh, 2003; Seo et al., 2018). Additionally, RES decreased the lipid peroxide levels in H19-7 cells exposed to Aβ (Rege et al., 2015), inhibited membrane lipid peroxidation and decreased the toxic effects produced by ROS (Vingtdeux et al., 2008; Rege et al., 2015). Tamagno et al. (2002) concluded that ROS production promotes the activation of β-secretase, stimulating the Aβ production (Murakami et al., 2005). In addition, Aβ-mitochondrial interactions induce oxidative stress and mitochondrial damages (Anandatheerthavarada et al., 2003). Also, ROS production results in oxidative damage to mitochondria causing the reduction of mitochondrial energy production (Reddy and Beal, 2005). Thus, creating a vicious cycle, where ROS promote Aβ production, which in turn, promotes ROS production (Anekonda, 2006; Li et al., 2012). In PC12 cells, RES decreased the modifications observed in mitochondrial membranes through the inhibition of ROS accumulation (Jang and Surh, 2003; Wang et al., 2018). The free radical production is related with the cognitive impairment observed in AD. Studies proved that RES could ameliorate cognitive impairment, increasing glutathione levels, an intracellular free radical scavenger, improving the cell viability (Savaskan et al., 2003; Kumar et al., 2007). Also, RES showed to reduce the high malondialdehyde and nitrite levels observed in AD rats (Kumar et al., 2007; Al-Bishri et al., 2017). Additionally, in vitro evidences showed that RES improved the functional recovery and reduced the DNA fragmentation and apoptosis through the modulation of glutamate uptake activity and S100B secretion (Kutuk et al., 2004; de Almeida et al., 2007). Additionally, RES inhibits the expression of proteins that lead to oxidative stress, like glycogen synthase kinase 3 (GSK-3β), as well inhibits intracellular enzymes including cyclooxygenase, lipoxygenases, or nitric oxide synthase (Bastianetto et al., 2000). Some studies have demonstrated that an endogenous enzyme, known as heme oxygenase (HO-1), has neuroprotective properties, providing resistance against oxidative stress (Bastianetto and Quirion, 2010). RES was described as a stimulator of HO-1 activity, protecting AD models against oxidative stress (Kwon et al., 2011; Li et al., 2012). Still, sirtuin 1 (SIRT1) plays an important role against the oxidative stress, protecting the neurons. An in vitro study suggested that RES protected SK-N-BE cells against the oxidative stress and toxicity produced by Aβ, through the SIRT1 activation that inhibited the hydrogen peroxide production (Albani et al., 2009). Aβ monomers with α-helix conformation are produced by the sequential action of β- and γ-secretases responsible for the proteolytic cleavage of amyloid precursor protein. Then, a transition in the conformation from α-helix to β-sheet is observed. Aβ monomers, in particular Aβ1–42, rapidly form self-aggregates to produce oligomer aggregates that are known to initiate the pathogenic cascade. Posteriorly, the aggregation of oligomers forms protofibrils, which in turn form fibrils and then Aβ plaques (Walsh and Selkoe, 2007; Ahmed et al., 2010). Initially, it was assumed that only Aβ fibrils could exert toxic effects. However, in recent years studies have revealed that Aβ oligomers can be more toxic than mature fibrils by inducing synaptic dysfunction, playing a key role in the development of the disease (Walsh and Selkoe, 2007; Arendt, 2009; Ballard et al., 2011). Thus, small-molecule drugs, which interfere with the Aβ–aggregation inhibiting the formation of the supposed toxic Aβ oligomers, are a suitable approach in the prevention and treatment of AD (Klafki et al., 2006). Evidences showed that RES delays or even inhibits the Aβ aggregation (Feng et al., 2009; Andrade et al., 2015; Loureiro et al., 2017). As observed in Figure 3 the formation of amyloid fibrils was prevented with RES treatment, through the binding of RES to the N-terminus of Aβ monomers (Fu et al., 2014). RES altered the Aβ1–42 oligomers conformation, prevented the oligomers aggregation, the Aβ1–42 fibril formation and destabilized Aβ aggregates (Feng et al., 2009; Mishra et al., 2009; Pasinetti et al., 2015). FIGURE 3. Transmission electron microscopy analysis of the resveratrol effect on Aβ1–42 aggregation. The Aβ1–42 concentration was 25 μM and the resveratrol concentration was 80 μM. The samples were incubated at 37°C in phosphate buffered saline buffer. The left side of the figure represents the incubation of Aβ1–42 without RES, and the right side shows Aβ1–42 incubated with RES. As shown in the figure RES prevented the formation of amyloid fibrils. The scale bar corresponds to 200 nm. Additionally, RES has the ability to interfere in aggregation indirectly. The aggregation of Aβ plaques can be prevented by the binding of a transporter protein called transthyretin. A study showed that RES increased the binding of transthyretin to Aβ oligomers (Ribeiro et al., 2012). Also, RES reduced the Aβ production (Pasinetti et al., 2015) through the activation of SIRT1 that activate the α-secretase (Donmez et al., 2010; Granzotto and Zatta, 2014) and the reduction of the activity of β-secretase (Jeon et al., 2007; Porquet et al., 2014). Additionally, and since high levels of cholesterol promote the Aβ production, the ability of RES to maintain the cholesterol homeostasis proved to be determinant (Ahmed et al., 2017). In a in vivo study, RES inhibited the formation of amyloid plaques in medial cortex, striatum and hypothalamus, in 48, 89, and 90%, respectively (Karuppagounder et al., 2009) and decreased the insoluble Aβ1–42 level in hippocampus (Zhao et al., 2015). Also, RES converted toxic species such as oligomers, protofibrils, and fibrils into non-toxic aggregated (Ladiwala et al., 2010; Rushworth et al., 2013). Concerning the non-toxic species like Aβ monomers, RES did not induce alterations (Ladiwala et al., 2010). Another study proved that when RES was incubated with Aβ, it has capacity to decrease the length and the amount of fibrils (Ge et al., 2012) and amyloid plaques (Porquet et al., 2014). Evidences suggested that RES markedly slowed down the formation of Aβ fibrils and their extension by disrupting Aβ1–42 hydrogen bonding. Also, an in vitro experiment showed that RES reduced the Aβ secretion and Aβ fibrils accumulation (Marambaud et al., 2005). A study, using neuronal and non-neuronal cells and mice models, showed that the anti-amyloidogenic activity of RES is mediated by AMP-activated protein kinase (AMPK). RES stimulated the AMPK activation (Vingtdeux et al., 2010; Porquet et al., 2013), which leads to the decrease of Aβ levels and extracellular Aβ accumulation (Vingtdeux et al., 2010). The imbalance between Aβ production and the elimination of the peptide leads to the progress of AD (Kurz and Perneczky, 2011). The augmented levels of Aβ peptide found in the brain are a consequence of the overproduction and/or the reduced clearance of Aβ (Bates et al., 2009). Some causes are pointed for the deficient Aβ elimination including the increase of aggregation and difficulty to remove Aβ through the BBB (Mawuenyega et al., 2010; Sagare et al., 2012). Thus, this mechanism has been studied over the past several years (Tanzi et al., 2004; Kurz and Perneczky, 2011). Resveratrol promotes intracellular Aβ clearance of aggregates (Marambaud et al., 2005; Pasinetti et al., 2015) and preformed Aβ1–42 fibrils in vitro (Feng et al., 2009) through promotion of intracellular proteasomal activity (Marambaud et al., 2005; Bastianetto et al., 2015). Besides that, RES stimulated the activation of AMPK target mTOR, a mammalian target of rapamycin that regulates the cellular energy homeostasis, triggering the autophagy and lysosomal Aβ degradation (Vingtdeux et al., 2010, 2011). Low-density lipoprotein receptor-related protein 1 and several Aβ-degrading enzymes were reported to be stimulators of Aβ clearance. Studies proved that RES activates these proteins, stimulating the Aβ clearance. As examples, the enzyme neprilysin seems to be responsible for the Aβ degradation. RES increased the neprilysin levels, decreasing the Aβ deposition and promoting Aβ degradation (El-Sayed and Bayan, 2015). On the other hand, some works demonstrated that the BBB plays a key role in Aβ clearance and that its disintegration can lead to inefficient clearance (Deane et al., 2004). In vivo studies showed that RES protected the BBB integrity (Saha et al., 2012), through the increase of claudin-5 expression and decrease of the receptor for advanced glycation end products (RAGE) (Zhao et al., 2015; Moussa et al., 2017). RAGE is a receptor of the immunoglobulin super family that is found in BBB and that is responsible for the Aβ transport, from the blood to the brain, leading to mitochondrial dysfunction (Takuma et al., 2009). RAGE levels are found to be higher in AD pathology. A study proved that RES reduced the RAGE expression in vascular cells (Slevin et al., 2012). Tau, the major constituent of NFTs, is a microtubule-associated protein with the function of assembling and stabilizing microtubules in the neuronal cell and it is also involved in the axoplasmatic transport. These characteristic inclusions observed in AD neurons are constituted by hyperphosphorylated tau (Lee et al., 2001; Goedert et al., 2006). The amyloid cascade hypothesis proposes that high levels of Aβ induces modifications in tau protein with consequent formation of NFTs, which causes the loss of synapses and neurons in areas related with cognitive functions such as memory (Gotz et al., 2004; Small and Duff, 2008). Tau is a soluble protein, but when NFTs formation happens, insoluble aggregates are also formed, which leads to the disruption of the structure and function of neurons. In an early stage, tau monomers aggregate forming oligomers, which in turn aggregate into a β-sheet and form NFTs (Meraz-Ríos et al., 2010). Human trials revealed a direct relationship between the degree of the disease and the amount of NFTs (Wilcock and Esiri, 1982; Arriagada et al., 1992). Therefore, drugs with the ability to prevent the tau aggregation or block its hyperphosphorylation can be a potential treatment approach (Lee and Trojanowski, 2006; Schneider and Mandelkow, 2008). Some studies showed the potential of RES against tauopathy related with AD, exhibiting a reduction of tau levels in rats (Al-Bishri et al., 2017; Sadhukhan et al., 2018) and inhibition of tau hyperphosphorylation and aggregation (Pasinetti et al., 2015; He et al., 2017). This reduction can be associated with the ability of RES to upregulate BAG2 levels, an endogenous protein responsible for removing the accumulated tau (Patil et al., 2013). Another study concluded that the ability of RES to protect against tau hyperphosphorylation and to stimulate the dephosphorylation of tau protein, is related with the inhibition of GSK-3β and CaMKII and the activation of protein phosphatase 2 (PP2A) (He et al., 2017; Jhang et al., 2017). PP2A is one of the main phosphatases that causes tau dephosphorylation. RES is a stimulator of PP2A activity reducing tau phosphorylation (Schweiger et al., 2017). Also, RES promoted the proteasomal degradation of tau through activating SIRT1 that induces the deacetylation of acetylated tau (Min et al., 2010). Neuroinflammation was described as a marker of AD pathology, playing a key role in AD progress, leading to the neurodegeneration and cognitive impairment (Granzotto and Zatta, 2014). In vivo and in vitro evidences suggest that Aβ aggregation stimulates neuroinflammation (Capiralla et al., 2012), as well as the insoluble Aβ deposits and NFTs (Wenk, 2003). Several studies proved that inflammatory responses, including the activation of macrophages, lymphocytes, astrocytes, and microglia lead to the expression of pro- and anti-inflammatory mediators like chemokines, neurotransmitters, cytokines, ROS, and complement factors (Heneka and O’Banion, 2007; Tansey et al., 2007), which promote the Aβ production (Ma et al., 2014), leading to neuroinflammation and even cell death (Liu and Hong, 2003). Several studies described RES as a strong anti-inflammatory molecule (Chen et al., 2013; Moussa et al., 2017). There are several mechanisms associated with its anti-inflammatory effects (Granzotto and Zatta, 2014). Numerous studies showed that RES inhibited the secretion and activity of several cytokines and molecules with inflammatory activity (Lu et al., 2010; Zhang et al., 2010). Among these molecules are ROS, interleukins, nitric oxide (Kim et al., 2006; Huang et al., 2011), monocyte chemoattractant protein-1 and prostaglandin E2 (Kim et al., 2006). Also, an in vivo study revealed that RES decreased inflammatory markers such as IL-6, CRP, TNF-α, and TGF-β (Lu et al., 2010; Al-Bishri et al., 2017). Numerous in vitro and in vivo works demonstrated that RES inhibited the activation of microglia (Zhang et al., 2010; Capiralla et al., 2012) and astrocyte (Scuderi et al., 2014), modulating the NF-κB activity (Zhao et al., 2015; Sathya et al., 2017) and inhibiting the TLR4/NF-κB/STAT signaling cascade (Capiralla et al., 2012). Also, RES activated the cAMPPRKA-AMPK-SI RT1 signaling pathway, that stimulated the autophagy, thus reducing the inflammation (Chen et al., 2013). On the other hand, matrix metallopeptidase 9 (MMP9) was considered as displaying a key role in neuroinflammation. Studies showed that MMP9 actives several cytokines and chemokines, contributes to the BBB rupture and facilitates release of leukocytes in brain parenchyma. RES reduced MMP9 levels (Vafadari et al., 2016) and the input of leukocytes and others inflammatory mediators into the brain, and regulated the BBB permeability (Moussa et al., 2017). SIRTs were also described as important for neurodegeneration, controlling several processes, including inflammation. Two categories of SIRTs, SIRT1 and SIRT2, exert an influence on neurons. While SIRT1 has neuroprotective activity, SIRT2 promotes neurodegeneration (Scuderi et al., 2014). Findings suggests that RES is capable of binding to the N-terminal of SIRT1 increasing their activity (Milne and Denu, 2008; Feng et al., 2013), decreasing Aβ accumulation (Kim et al., 2007; Feng et al., 2013), protecting against neurotoxicity (Porquet et al., 2013) and cell death (Sinclair and Guarente, 2014; Sathya et al., 2017). As mentioned above, RES exhibits several beneficial properties for AD, which can be enhanced by the use of NPs. Thus, some authors proposed promising RES DDS to prevent and treat AD (Table 1). Frozza et al. (2010) prepared lipid-core nanocapsules (NCs) of capric/caprylic triglyceride and sorbitan monostearate, using the interfacial deposition of the polymer technique. The attained NCs showed an average size of 250 nm, with a negative zeta potential and an encapsulation efficiency of almost 100%. The NCs remained stable for 3 months at 25°C. This research aimed the study of the biodistribution of the developed NCs in the brain tissue of healthy rats. In vivo evidences suggested a higher concentration of encapsulated RES in the brain, kidney and liver tissues than for the free RES. Also, animals treated with encapsulated RES showed less gastrointestinal damage (Frozza et al., 2010). TABLE 1. Currently developed DDS for RES delivery for AD’s therapy. Later, the same group tested these NCs in rats exposed to Aβ, comparing the neuroprotective effects of RES-loaded NCs with free RES. The results showed that RES-loaded NCs decreased the harmful effects caused by Aβ, such as, memory loss, learning difficulty, reduced synaptophysin levels, activated astrocytes and microglial cells, among others. Free RES partially improved de adverse effects of Aβ. Improved efficiency of RES-loaded NCs is due to NCs’ ability to increase the RES concentration in brain tissue (Frozza et al., 2013a,b). Also, assays with rat organotypic hippocampal cultures showed that lipid-core NCs improved the neuroprotective effects of RES against ROS formation and cell death caused by Aβ, inhibiting the release of TNF-α, IL-1β, and IL-6. In addition, loaded-RES increased the release of IL-10 preventing or decreasing the glial cells and JNK activation (Frozza et al., 2013a). Thus, the encapsulation of RES in lipid-core NCs represents a promising approach in AD prevention and treatment. Lu and colleagues developed and characterized RES-loaded polymeric micelles. The micelles were composed by poly(caprolactone) (PCL), an amphiphilic block co-polymer. The micelles exhibited a size less than 100 nm and a spherical shape with a smooth surface. The NPs were coated with polyethylene glycol (PEG). The DDS presented a high value of encapsulation efficiency. In this work, the group evaluated the effects of free and loaded-RES on PC12 cells viability. Free RES proved to be cytotoxic, not protecting against Aβ and decreasing cell viability. Instead, loaded-RES was non-toxic and protected PC12 cells against Aβ through the reduction of oxidative stress and caspase-3 activity. Therefore, this nanosystem seems to have a great potential as therapeutic method to treat AD (Lu et al., 2009). Recently, Loureiro and co-workers encapsulated RES into solid lipid nanoparticles (SLN) composed by 1,2-distearoyl-sn-glycero-3-phosphoethanolamine-N-maleimide(polyethylene glycol)-2000 (DSPE-PEG) and 1,2-dipalmitoyl-sn-glycero-3-phosphoethanolamine-N-lissamine rhodamine B sulfonyl (LissRhod-PE). SLN were characterized through their size, zeta potential, polydispersity index, and morphology. SLN presented an average size of 176 nm, a neutral zeta potential and a polydispersity index of 0.16 (Loureiro et al., 2017). The SLN presented a high value of encapsulation efficiency, around 94%. The stability of the prepared nanosystems was assessed, and the results showed that SLN were stable for 3 months. SLN showed to improve the anti-aggregation effect of RES, ensuring the prevention of Aβ fibrillation. To direct the developed nanocarrier to the BBB, SLN were functionalized with OX26 monoclonal antibody molecules (mAb), a mAb that recognizes the transferrin receptor overexpressed in BBB. Also, the ability of OX26 for brain targeting was compared conjugating LB 509 mAb, an antibody, which recognize α-synuclein, a protein non-specific to the BBB. The stability of both formulations was tested, and results showed that SLNs conjugated with mAb were stable for 1 month. An in vitro BBB model was used to evaluate SLN brain targeting potential. Results showed the transport of SLN through the BBB model was twofold higher for the OX26-modifed SLN than for SLNs functionalized with LB 509, and fourfold higher when compared with unfunctionalized SLNs. Consequently, the transcytosis of SLN was improved with OX26 functionalization (Loureiro et al., 2017). Thus, SLN conjugated with OX26 represent a promising nanosystem to the brain delivery of RES. After AD, PD is the most common neurodegenerative disorder that causes motor impairment on the middle-aged or elderly population (Schapira, 2009). The symptoms include irregular onset of bradykinesia, disturbance in gait, rigidity, and resting tremor (Schapira et al., 2006; Wang et al., 2011; Chopra et al., 2013). A pathological mark of PD is the decrease of nigral dopaminergic neurons that are responsible for the dopamine production in the midbrain (Peterson and Flood, 2012; Hirsch et al., 2013). It is caused by the augmented mitochondrial dysfunction and oxidative stress that might occur due to the selective inhibition of complex I action (Hu et al., 2010; Tapias et al., 2014). Also heredity and environmental factors, calcium overload, immune abnormalities and various neurotoxins could be responsible for the loss of neurons (Abou-Sleiman et al., 2006). Resveratrol has shown relevant therapeutic effects for the treatment of PD. Numerous findings have proved the RES neuroprotective effects both in vitro and on in vivo models as presented in Figure 4 (Olanow and Tatton, 1999; Olanow et al., 2004; Sonmez et al., 2007; Jin et al., 2008; Kairisalo et al., 2011; Hauser and Hastings, 2013; Zeng et al., 2017). FIGURE 4. Schematic representation of RES pharmacological activities on PD therapy. The oxidative stress has been related with the development of PD. The death of dopaminergic neurons within the substantia nigra is observed in PD patients (Olanow and Tatton, 1999; Hauser and Hastings, 2013). It is believed that the death of dopaminergic neurons results from the increase of oxidative stress (Jenner, 2003; Hald and Lotharius, 2005; Henchcliffe and Beal, 2008). The use of therapeutic molecules to decrease the amount of apoptotic dopaminergic neurons and reduce the oxidative stress in the substantia nigra could be a significant strategy for the PD prevention. Reduction of the oxidative stress with specific antioxidants has been proved to be effective (Olanow et al., 2004; Lu et al., 2013). The RES attenuates oxidative stress in PD animal models, demonstrating to be a neuroprotective agent, both in vitro and in vivo (Jin et al., 2008; Kairisalo et al., 2011; Zeng et al., 2017). Similar to the case of AD, RES acts mainly by inhibiting ROS produced by hippocampal cells to reduce cell death, by activating AMPK (Bastianetto et al., 2000; Virgili and Contestabile, 2000; Nicolini et al., 2001; Lee et al., 2007). Also, it was discovered that RES is able to suppress COX-2 and lipid peroxidation (Szabo, 2009). This molecule increases the expression of some antioxidant enzymes in the brain of healthful animals and presents an excellent antioxidant effect (Mokni et al., 2007). Mitochondrial complex I is appointed as one of the main causes of ROS production (Jenner, 2003; Henchcliffe and Beal, 2008). Pathological and biochemical studies in PD animal models presented diseased-specific decrease in protein level or in the substantia nigra pars compacta in mitochondrial complex I activity. Post-mortem brain studies genetic analysis in humans showed similar results (Alam et al., 1997; Floor and Wetzel, 1998). Abnormalities of mitochondrial energy metabolism can induce modification in oxidative homeostasis, increasing the development of free radicals (Saravanan et al., 2005). Diminution of mitochondrial dysfunction with specific antioxidants, such as RES, has been proved to be effective in vivo (Olanow et al., 2004; Jin et al., 2008; Kairisalo et al., 2011; Zeng et al., 2017). Despite the efforts to develop a new therapy for PD, the available therapies only attenuate the symptoms. However, they present severe adverse effects (Wang et al., 2016). This type of treatments precludes their long-term use. The treatments with RES strongly suggest that animal models with PD have their symptoms attenuated. Nowadays, a very few approaches have been tested with RES encapsulated into NPs for the treatment of PD (Table 2). TABLE 2. Currently developed DDS for RES delivery for PD’s therapy. Wang et al. (2011) explored a different approach to protect RES from Polygonum cuspidatum in cells of PD rats. RES was encapsulated into liposomes and then tested in nigral cells. This in vitro experiment was established by unilateral microinjection of 6-hydroxy dopamine in the striatum. In order to evaluate the RES effect, the formulations containing free RES and RES encapsulated in the liposomes were administered intragastrically. Oral treatment with RES or RES encapsulated in liposomes proved to be beneficial. In fact, the rotational behavior was considerably enhanced. Also, the amount of total ROS, the nigral cells loss and apoptosis decreased. Still, RES encapsulated in liposomes exhibited more intense effects than free RES. da Rocha Lindner et al. (2015) have explored the neuroprotective effects of RES-loaded polysorbate 80 (PS80)-coated poly(lactide) (PLA) NPs in vivo in C57BL/6 mice. During the treatment, the animals received free or encapsulated RES intraperitoneally as well as intranasal administration of 1-methyl-4-phenyl-1,2,3,6-tetrahydropyridine (MPTP). MPTP is a well-known neurotoxin that stimulates PD symptoms and injuries dopaminergic neurons. The MPTP is able to produce disturbances on olfactory taste and recognition memory, in addition to causing striatal oxidative stress and reducing the expression of tyrosine hydroxylase in striatum. In this study the authors observed significant neuroprotective effects beside MPTP-induced behavioral and neurochemical alterations when the animals were treated with RES encapsulated into the NPs. On the other hand, the beneficial effects were not observed in the animals treated with free RES. Herein, PLA NPs coated with PS80 are a promising nanocarrier to transport the RES and consequently treat or prevent PD. Pangeni et al. (2014) strategy was to formulate a RES loaded Vitamin E nanoemulsion for PD patients brain targeting. The group formulated a kinetically stable nanoemulsion (o/w). To produce this nanoemulsion the authors used vitamin E and propylene glycol mono caprylic ester (Sefsol®) with a 1:1 ratio as the oil phase, Tween 80 as the surfactant and Transcutol P as the co-surfactant. Pharmacokinetic studies presented a significant amount of the drug in the brain after intranasal administration of the nanoemulsion. Since the nasal area is very permeable and highly vascularized, the nasal route could be a valuable strategy to administer drugs intended for brain delivery (Pardeshi et al., 2013a,b). Also, the nasal area presents low enzyme levels, great surface area, 150 cm2, and high total blood flow per cm3. It results in a rapid absorption that could be very beneficial in drug administration. Furthermore, this route is non-invasive and it is an alternative route that effectively bypasses the BBB, circumventing significant intestinal and hepatic metabolism (Haque et al., 2012; Mittal et al., 2014). Results showing a higher RES amount in the brain. This fact confirms the targeting efficiency of the developed nanoemulsion. Histopathological analysis demonstrated a decreased degenerative change in the animal groups administrated with the RES nanoemulsion. The levels of glutathione and superoxide dismutase increased, and the level of malondialdehyde decreased in the group treated with the nanoemulsion. Recently, Palle and Neerati (2018) studied the effect of RES encapsulated into NPs against rotenone-induced Parkinson’s rats. Some works demonstrated that exposure to pesticides and environmental toxins can lead to an oxidative damage and mitochondrial dysfunction (Swarnkar et al., 2011). Rotenone is a natural organic pesticide, obtained from the plant roots of Leguminosae family. This molecule is able to cross the BBB and causes neurotoxicity by mitochondrial complex-I inhibition (Alam and Schmidt, 2002; Bueler, 2009). In rodents, more specifically in rats, rotenone causes behavioral, biochemical and neuropathological symptoms comparable to the humans’ patients with PD (Betarbet et al., 2000). In this work the authors compared the effect of free and the encapsulated RES. The NPs were produced by temperature-controlled antisolvent precipitation. As stabilizer the hydroxypropyl methylcellulose was used. Here, the rats were separated into four groups: (I) control animals, (II) animals administered with rotenone, (III) animals administered with rotenone and free RES, and (IV) animals administered with rotenone and RES encapsulated in NPs. It was observed that RES encapsulated in NPs could preserve RES in blood for a longer time. That way, with the RES encapsulation it is possible to increase its bioavailability and its pharmacological activity. Behavioral analysis was assessed by rota rod test and rearing behavior. It was observed that chronic rotenone treatment instigated oxidative stress, motor deficits, mitochondrial dysfunction, and decreased rearing behavior. RES encapsulated into NPs presented better efficacy than free RES. In the group treated with encapsulated RES it was observed reduction of the behavioral modifications, oxidative stress, mitochondrial dysfunction, and biochemical and histological changes. Gliomas are brain tumors originated from glia cells and they are the type of cancer with the second-highest mortality rate. The type of glioma tumor with the higher incidence, aggressiveness and mortality is the glioblastoma multiforme tumor, that accounts for 77% of brain tumors. The first-line treatment of glioma tumors is based on a multimodal approach combining tumor resection with surgery, chemotherapy and radiotherapy. However, its high proliferation rate and invasiveness contributes to its high resistance to therapy (Bush et al., 2017; Ramalho et al., 2018a). Inhibition of carcinogenesis by RES in glioma tumors can occur at several stages, as inhibition of angiogenesis, induction of apoptosis, tumor growth inhibition, and cell cycle regulation. Resveratrol chemopreventive activity in leukemia cells was reported for the first time in Jang et al. (1997). Since then, RES displayed several anticancer properties in many cellular and animal models for glioma tumors and several mechanisms in which the molecule exerts these anticancer effects have been reported. These mechanisms are presented and resumed below in Figure 5. FIGURE 5. 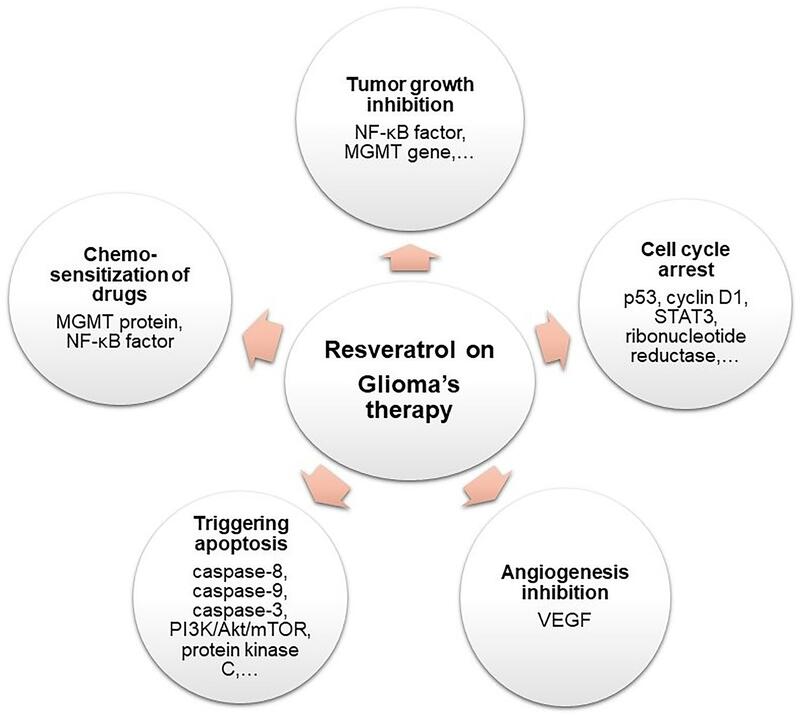 Schematic representation of RES pharmacological activities on glioma therapy. Several molecules are involved in the carcinogenesis and progression of brain tumors and can be envisaged as therapeutic targets for RES. Tumor suppressor cytoplasmic protein p53 could be one of the crucial targets of RES antiproliferative activity, since most of the glioma tumors have either mutation in p53 or defects in its pathway (Rivlin et al., 2011). P53 inhibits DNA replication in response to stress and DNA damage in mutant cells, by promoting cell cycle arrest at G1/S phase. RES upregulates p53 protein expression by promoting its accumulation and phosphorylation (Clark et al., 2017). RES also suppresses the progression of the cell cycle by downregulating the expression of enzyme cyclin D1, involved in the transition from the G1 to the S phase of the cell cycle (Pirtoli et al., 2016; Varoni et al., 2016). RES also inhibits the ribonucleotide reductase required for the DNA synthesis at the S-phase of the cell cycle, resulting in the cell cycle arrest (Neves et al., 2012). Another largely studied target of RES is the transcription factor STAT3. The malignancy and recurrence of glioma tumors is affected by the signaling pathway of STAT3, that is extensively activated by phosphorylation in brain tumors (Attarha et al., 2017). Its role in the carcinogenesis of these tumors includes the regulation of cell cycle progression, mediating the transcription of many different genes, being involved in many cell mechanisms such apoptosis, angiogenesis and tumor invasion of adjacent tissues, acting as an important indicator for the patient’s survival rate, tumor growth, and progression (Yi-Ping et al., 2012). The invasiveness and malignancy degree of glioma tumors is related with an aberrant neovascularization and the cellular invasion of adjacent tissues. The vascular cell proliferation and invasion to surrounding tissues are regulated by several cytokines and growth factors and depend on a series of molecular events. The vascular endothelial growth factor (VEGF) promotes capillary formation by stimulating endothelial cells proliferation, migration, and invasion into adjacent tissues to form vessels (Smith et al., 2015). Recent studies showed that RES inhibits VEGF expression and activity in glioma cells, suppressing angiogenesis (Tseng et al., 2004; Wang et al., 2015). The proteolysis of the extracellular matrix is also a crucial event for the infiltrative growth of glioma. RES was found to suppress NF-κB factor activation by hampering the nuclear translocation of its p65 subunit, leading to a downregulation on the expression of uPA/uPAR genes reducing the glioma cell invasion (Ryu et al., 2011). Programmed cell death – apoptosis – causes cell changes, as cell shrinkage, loss of cell membrane integrity, and DNA fragmentation causing the cellular death. Apoptosis can be induced by several intra and extracellular factors and the absence of apoptotic responses is crucial to the development of tumors and resistance to therapy (Brown and Attardi, 2005). RES is reported to induce apoptosis by several mechanisms in glioma cells. In fact, Tseng et al. (2004) showed that RES induced apoptosis of glioma cells on rat models. RES can induce apoptosis either through the caspase-8-dependent or the caspase-9-dependent pathway in U251, U87, and C6 glioma cells (Jiang et al., 2005; Zhang et al., 2007; Filippi-Chiela et al., 2011). Both are initiator caspases responsible for the activation of effector caspase-3 (by hydrolytic cleavage), that will disassemble glioma cells into apoptotic bodies (Aggarwal et al., 2004). RES also promotes apoptosis by downregulating the expression of survivin, an inhibitor of the effector caspases (Hayashibara et al., 2002). Recent studies show that RES can promote caspase-3 activation by inhibiting the PI3K/Akt/mTOR intracellular signaling pathway in glioma cells (Jiang et al., 2009a,b). The PI3K/Akt/mTOR pathway is overactive in glioma tumors, resulting in reduced apoptosis and increased tumor proliferation, being frequently implicated in resistance to anticancer therapy (Burris, 2013). RES can also induce apoptosis by suppressing another molecular mechanism, the signaling pathway of protein kinase C (Couldwell et al., 1991). It is reported that protein kinase C is overexpressed in glioma cells and is related with cellular proliferation (Tseng et al., 2004). Temozolomide is the standard drug used for glioblastoma therapy, however, its use is highly ineffective due to several resistance mechanisms and biological barriers (Mallick et al., 2015). O(6)-Methylguanine DNA-methyltransferase (MGMT) protein is related to resistance to therapy with temozolomide, since it repairs the DNA damage caused by temozolomide-induced methylation. Huang and colleagues showed that RES decreased the expression of the MGMT protein in glioblastoma cells, by suppressing the activation of the NF-κB transcription factor essential for MGMT activation. Thus, RES reverses the resistance to therapy and increases the efficiency of temozolomide (Huang et al., 2012). Several other authors showed that RES enhanced chemosensitization of glioma cells to temozolomide activity, by altering multiple signaling pathways and promoting apoptosis (Lin et al., 2012; Yuan et al., 2012; Li et al., 2016) and cell cycle arrest (Filippi-Chiela et al., 2013). All the find data, showing a slower tumor growth rate and prolonged animal survival time, suggest that prolonged treatment with RES is a suitable strategy for the therapy of glioma tumors. However due to the limitations associated to its use, nanobased strategies could be envisaged to increase its bioavailability and activity. Several nanotechnology approaches have been proposed in the last decade for glioma tumors’ therapy with several different drugs and nanomaterials (Li et al., 2014; Householder et al., 2015; Yao et al., 2015; Ramalho et al., 2018b). 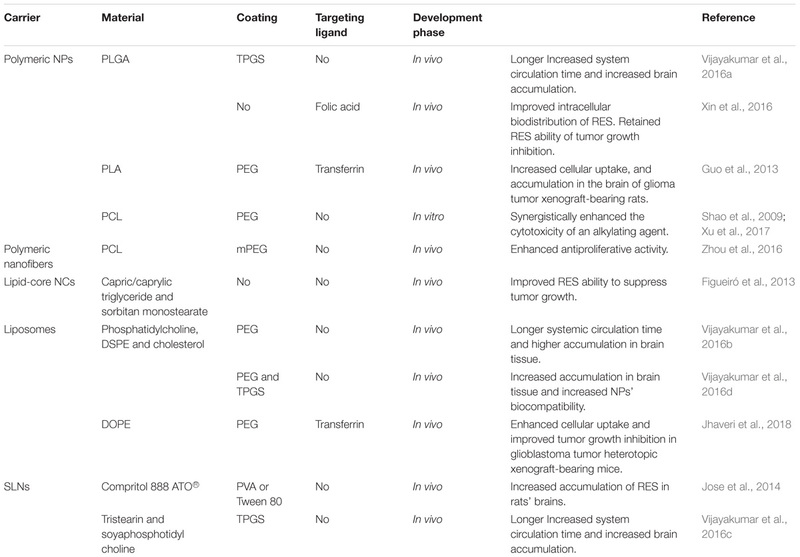 In this section we focused on the DDS already reported for the encapsulation and brain delivery of RES to glioma tumor cells (Table 3). TABLE 3. Currently developed DDS for RES delivery for glioma’s therapy. Shao and colleagues proposed for the first time the entrapment of RES for glioma therapy. The group developed NPs composed of methoxy poly(ethylene glycol)-poly(caprolactone), (mPEG-PCL). The NPs were prepared by nanoprecipitation. The nanosystems had approximately 80 nm, low and negative zeta potential and high loading efficiency values (about 90%). The NPs were evaluated in vitro, using rat glioma cells. The attained results showed that the NPs are efficiently internalized by the target cells and indicated that nanoencapsulation of RES did not decreased its antiproliferative activity. The developed nanosystem exhibits similar toxicity to free RES at high concentrations, but superior toxicity at lower doses, suggesting that this could be a suitable strategy for glioma treatment, since encapsulated RES retains its ability to increase intracellular ROS levels, inhibiting the growth of glioma tumors (Shao et al., 2009). A few years later, the group proposed the use of this developed nanosystem for the co-delivery of RES with temozolomide, to increase the cellular chemosensitivity to the alkylating agent. The nanosystems exhibited increased mean dimensions due to the entrapment of both drugs (130 nm), still low negative zeta potential and encapsulation efficiency values of about 80% for both drugs. In vitro studies were conducted with human glioblastoma cell lines and showed an efficient uptake and that RES synergistically enhanced the cytotoxicity of temozolomide. Encapsulation of RES in the developed nanocarrier enhanced apoptotic induction and inhibition of migration and invasion. The co-delivery of both drugs also resulted in a more efficient tumor growth inhibition than the combination of both free drugs, or each drug alone. The attained results proved that the dual-delivery of these drugs could be a suitable strategy for glioblastoma therapy (Xu et al., 2017). Figueiró and colleagues evaluated the efficiency of the previously developed NCs (Frozza et al., 2010) in rat glioma cells and in glioma tumor orthotopic xenograft-bearing rats. The authors verified that encapsulated RES decreased in vitro cellular viability more efficiently than its free form. The group also concluded that encapsulated RES maintains the ability of induction of apoptosis and cell cycle arrest. Animal studies showed that encapsulation of RES allowed a decrease in the dimensions of the tumor as well as the reduction in the occurrence of some tumor malignancy characteristics, indicating a less aggressive, invasive and proliferative tumor (Figueiró et al., 2013). Guo and colleagues developed pegylated PLA NPs using a single water-in-oil emulsion technique. The attained PLA NPs had about 150 nm, net negative charge and high encapsulation efficiency of around 80%. Transferrin was added to the surface of the NPs. Since its receptor is overexpressed in glioma tumor cells and in the endothelial cells of the BBB, the nanosystem envisages a dual-targeting strategy for tumor brain delivery. In vitro studies showed that encapsulated RES had much higher cytotoxicity as compared with its free form, in both rat glioma and human glioblastoma cell lines, since it enhanced the activation of an effector caspase, increasing apoptosis rate. Modification with transferrin proved to be a suitable strategy since it increased cellular uptake in the studied cell lines, and drug accumulation in the brain of glioma tumor xenograft-bearing rats (Guo et al., 2013). Jose and co-workers prepared compritol 888 ATO® SLN using the solvent evaporation, high speed homogenization and ultrasonic techniques (Jose et al., 2014). The group evaluated the influence of drug-lipid ratio and used stabilizer [tween 80 or polyvinyl alcohol (PVA)] on physicochemical properties of the NPs and their encapsulation efficiency. The most adequate nanoformulation had sizes of about 250 nm, negative charge and low entrapment efficiency, being able to encapsulate only about 35% of the used RES. In vitro studies using rat glioma cells showed a similar cytotoxicity in encapsulated RES and in the free form of the drug. However, the developed nanoformulation is advantageous since it presented an higher drug accumulation in the rats brain, proving that this nanosystem is able to bypass the BBB (Jose et al., 2014). Vijakumar and colleagues proposed the use of liposomes for the first time for glioma tumor therapy with RES. The liposomes composed of phosphatidylcholine, DSPE-PEG and cholesterol were prepared by the by thin-film hydration methodology. The nanoformulation presented mean dimensions of 250 nm, negative superficial charge and about 80% of loading efficiency. The developed liposomes showed longer systemic circulation time and higher accumulation in brain tissue than free RES, proving to that this nanoformulation is an efficient nanocarrier for the brain delivery (Vijayakumar et al., 2016b). Later in the same year, Vijayakumar and co-workers presented an improved liposomal nanoformulation for the delivery of RES. The liposomes were coated with D-α-tocopherol polyethylene glycol 1000 succinate (TPGS) to increase the bloodstream circulation time and brain delivery of RES. Several drug/lipid ratios and sonication time were evaluated, and the most suitable nanoformulation was chosen. The optimal formulation exhibited small dimensions (65 nm), neutral charge and an entrapment efficiency of almost 80%. The RES nanoformulations were evaluated in vitro and in vivo. Experiments using rat glioma cells showed significantly higher cytotoxicity for encapsulated RES. Additionally, biodistribution tests in rats showed an increase in the amount of RES in the brain when delivered by the liposomes, indicating the passive brain targeting potential of the nanoformulation. The coating of liposomes with TPGS prolonged the systemic circulation of RES, showing no platelet aggregation or hemolysis (Vijayakumar et al., 2016d). The authors again employed the same strategy to increase systemic circulation and passive brain targeting of RES with different types of NPs for glioma therapy. They proposed the use of poly(lactic-co-glycolic acid) (PLGA) and SLN. Tristearin and soyaphosphotidyl choline lipids were used for the nanoformulation of SLN prepared by the solvent emulsification evaporation method. Several experimental parameters were evaluated, and the most adequate nanoformulation exhibited sizes of about 200 nm, negative surface charge and entrapment efficiency values of about 70% (Vijayakumar et al., 2016c). The PLGA NPs developed by Vijayakumar and co-workers were prepared using the single-emulsion method. The influence of different ratios of organic to aqueous solvent and polymer/TPGS on these NPs physicochemical properties were also assessed. The optimal nanoformulation was chosen (size of 175 nm, negative superficial charge and loading efficiency of about 60%) (Vijayakumar et al., 2016a). Encapsulated RES in both PLGA NPs and SLN showed higher cytotoxicity than its free form in rat glioma cells. When RES molecules were delivered by the nanocarriers, a higher accumulation of the drug in the brain of the rats was verified. These nanoformulations also proved to increase system circulation time and enhance passive brain targeting, while being hemocompatible and safe after intravenous administration (Vijayakumar et al., 2016a,c). Zhou and co-workers developed mPEG-PCL block copolymer nanofibers for RES delivery in glioblastoma therapy. In vitro experiments with a glioblastoma cellular line obtained from human patients showed an efficient cellular internalization of the nanofibers and higher cytotoxicity for encapsulated RES for long incubation periods. For short incubation periods, free RES exhibited higher toxicity to cells, due to the slow release of RES from nanofibers. Encapsulation of RES in nanofibers retained drug ability to promote apoptosis and delay cell migration and invasion. Finally, nanodelivery of RES enhanced its efficiency in decreasing the tumor in mice (Zhou et al., 2016). Jhaveri et al. (2018) developed negatively charged liposomes using the thin film hydration method. The prepared liposomes were smaller than 200 nm and presented a high encapsulation of the drug of around 70%. The nanosystems surface was modified using transferrin molecules to enhance uptake from glioblastoma cells. Although, authors did not mention the intent to target BBB, since transferrin receptor is also overexpressed in endothelial cells of this barrier, the system could foresee a dual-targeting strategy. Also, the developed liposomes exhibited suitable physicochemical properties (size and charge) to allow their passage across the BBB. In vitro competitive binding experiments with glioblastoma cells from humans proved that modification with transferrin molecules enhanced the cellular uptake by taking advantage of the transferrin receptor-mediated endocytic pathway. This increased internalization justifies the observed higher efficiency in decreasing cellular viability of RES when encapsulated in transferrin-modified liposomes, comparatively with non-modified nanosystems. The authors showed that encapsulated RES retained its ability to halt the progression of the cell cycle and to induce apoptotic cell death by activation of effector caspases. The prepared RES-liposomes improved tumor growth inhibition and survival in glioblastoma tumor heterotopic xenograft-bearing mice, proving that the proposed systems is suitable for therapy (Jhaveri et al., 2018). Xin colleagues proposed for the first time the encapsulation of RES in a nanosystem envisaged for glioma therapy and diagnostic simultaneous application. PLGA NPs were prepared using the nanoprecipitation method. The developed NPs were conjugated with indocyanine green (ICG), a clinical FDA-approved fluorescence imaging probe for tumor diagnosis, and folic acid for tumor cell targeting. DSPE-PEG was used for ICG conjugation. The obtained PLGA NPs with 120 nm and negative surface charge showed a high entrapment efficiency (almost 70%). In vitro experiments, on glioblastoma cells obtained from human patients, proved that the NPs are efficiently uptaken through folic acid receptor-mediated endocytic mechanism. Cytotoxicity studies also showed higher antiproliferative activity and higher apoptosis rate when RES was encapsulated. In vivo studies with heterotopic xenograft tumor-bearing mice proved that the nanoformulation is able to delay the elimination of ICG and RES, increasing the systemic circulation time. Biodistribution studies showed that encapsulation resulted in a higher accumulation of RES and ICG in brain tissue. The authors also concluded that encapsulation enhanced tumor growth inhibition and fluorescent signal of ICG, proving that the proposed nanocarrier could be a suitable in vivo theranostics tool (Xin et al., 2016). Several approaches have been studied in the last years to delivery RES to the brain. Different types of materials have been used to encapsulate RES and improve its activity. Some of the reported DDS present advantageous characteristics, such as enhanced stability, bioavailability, and biocompatibility. It is well-known that after administration, the NPs could be recognized by the immune systems being removed from the systemic circulation and being eliminated in the liver or spleen (Schroeder et al., 1998; Wohlfart et al., 2012). Some strategies can be used to increase the bloodstream circulation time of the NPs. One of the most popular strategies is the attachment or adsorption of different molecules to the NPs’ surface. Hydrophilic stabilizers, such as PEG and polysorbates can be used. These molecules also provide steric stabilization to the surface of the NPs and allow the attachment of other ligand moieties such as antibodies, aptamers, and proteins recognized by the receptors at the BBB cells (Masserini, 2013). However, these ligand molecules can facilitate the NPs recognition by the immune system and promote their elimination. Though, the coating the NPs’ surface with PEG molecules allows reducing this phenomenon (Chen and Liu, 2012). The attachment of targeting molecules to the NP’s surface can also be used as strategy to enhance the bioavailability of the encapsulated RES. The functionalization of the NPs with these ligand moieties allows the brain tissue targeting, since they are recognized by the existent receptors at the BBB, enabling the NP’s active transport across this barrier. Also using positively charged targeting ligands, their interaction with the luminal surface of the cells of the BBB is promoted by electrostatic forces (Pehlivan, 2013). The ligand must be carefully chosen since its receptor must be overexpressed at the BBB, and also should be preferentially specific to the brain tissue to reduce harmful effects to the healthy tissues and increase RES accumulation in the brain (Chen and Liu, 2012). The saturation of the receptor must also be carefully evaluated to circumvent competitive-binding of the natural ligand (Masserini, 2013). Although none of the reported NPs for the delivery of RES in the AD and PD treatment used specific molecular and cellular targets for these diseases, some targeting moieties can be explored such as α-synuclein protein, the parkin protein and leucine-rich repeat serine/threonine protein kinase 2 for PD, and α-, β-, and γ-synuclein peptides for AD (Garbayo et al., 2013). However, brain targeting was achieved by using specific ligands for BBB. In fact, several of the reported works for RES encapsulation for brain delivery demonstrate increased physicochemical features of the DDS when coating and targeting strategies are incorporated. Resveratrol displays several pharmacological properties, that include anti-inflammatory, anti-oxidant, and anti-tumor functions. However, its biopharmaceutical and pharmacokinetic issues limit its use as a therapeutic agent. RES is mainly insoluble in water and gastrointestinal fluids and has low oral absorption, resulting in a low bioavailability, limiting its clinical application. In this context, the use of NPs represents an advantageous approach to transport RES to its site of action. The drug pharmacokinetics is affected by the physicochemical properties of the NPs, conditioning their bioavailability and biodistribution. Also, the majority of the NPs have high stability and loading capacity. Furthermore, the NPs exhibit a controlled release profile. Various strategies using different nanomaterials were proposed for delivery of RES to prevent and treat different neurological diseases, including AD, PD, and glioma. These nanosystems containing RES proved to be effective in vitro and in vivo. It is expected to continue to improve these NPs to ultimately test them in preclinical and clinical trials. In the next years, it is expected to continue developing different types of NPs with surface modifications for RES brain targeting. SA and MR wrote the manuscript. MP and JL also contributed with the paper organization. All the authors contributed with the bibliographic research. This work was the result of the project POCI-01-0145-FEDER-006939 (Laboratory for Process Engineering, Environment, Biotechnology and Energy – UID/EQU/00511/2013) funded by the European Regional Development Fund (ERDF), through COMPETE2020 – Programa Operacional Competitividade e Internacionalizção (POCI) and by national funds, through FCT – Fundção para a Ciência e a Tecnologia; and NORTE-01-0145-FEDER-000005 – LEPABE-2 ECO-INNOVATION, supported by North Portugal Regional Operational Program (NORTE 2020), under the Portugal 2020 Partnership Agreement, through the European Regional Development Fund (ERDF); and FCT doctoral grants (PD/BD/105984/2014 and SFRH/BD/129312/2017). Aggarwal, B. B., Bhardwaj, A., Aggarwal, R. S., Seeram, N. P., Shishodia, S., and Takada, Y. (2004). Role of resveratrol in prevention and therapy of cancer: preclinical and clinical studies. Anticancer Res. 24, 2783–2840. Al-Bishri, W. M., Hamza, A. H., and Farran, S. K. (2017). 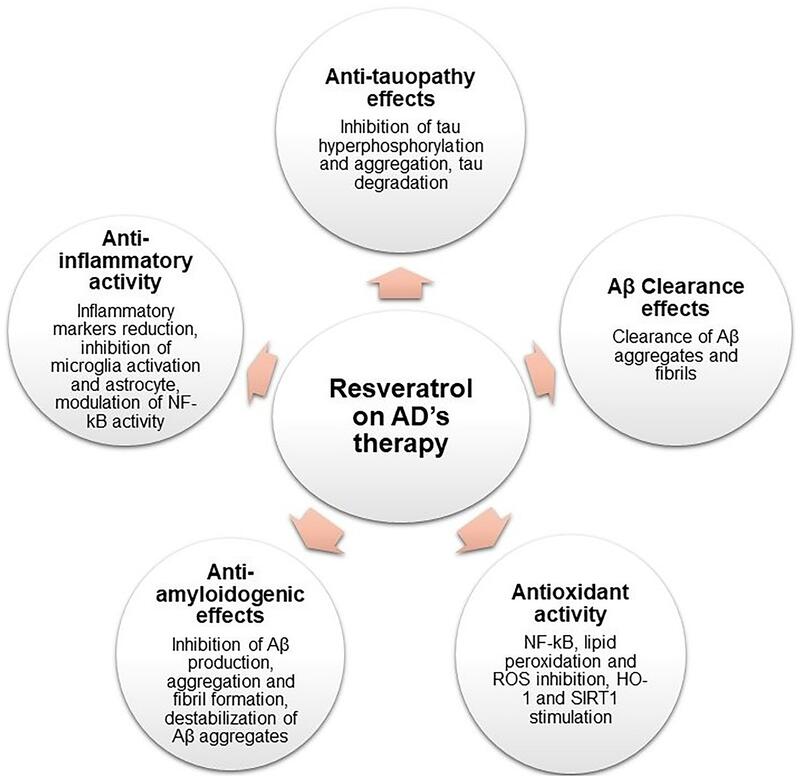 Resveratrol treatment attenuates amyloid beta, Tau protein and markers of oxidative stress, and inflammation in Alzheimer’s disease rat model. Int. J. Pharm. Res. Allied Sci. 6, 71–78. Anekonda, T. S. (2006). Resveratrol—A boon for treating Alzheimer’s disease? Brain Res. Rev. 52, 316–326. Jiang, H., Shang, X., Wu, H., Gautam, S. C., Al-Holou, S., Li, C., et al. (2009a). Resveratrol downregulates PI3K/Akt/mTOR signaling pathways in human U251 glioma cells. J. Exp. Ther. Oncol. 8, 25–33. Kim, Y. A., Lim, S. Y., Rhee, S. H., Park, K. Y., Kim, C. H., Choi, B. T., et al. (2006). Resveratrol inhibits inducible nitric oxide synthase and cyclooxygenase-2 expression in beta-amyloid-treated C6 glioma cells. Int. J. Mol. Med. 17, 1069–1075. Pirtoli, L., Belmonte, G., Toscano, M., Tini, P., and Miracco, C. (2016). Cyclin D1 Co-localizes with Beclin-1 in glioblastoma recurrences: a clue to a therapy-induced, autophagy-mediated degradative mechanism? Anticancer Res. 36, 4057–4062. Ryu, J., Ku, B. M., Lee, Y. K., Jeong, J. Y., Kang, S., Choi, J., et al. (2011). Resveratrol reduces TNF-α-induced U373MG human glioma cell invasion through regulating NF-κB activation and uPA/uPAR expression. Anticancer Res. 31, 4223–4230. Tanzi, R. E., Moir, R. D., and Wagner, S. L. (2004). Clearance of Alzheimer’s Abeta peptide: the many roads to perdition. Neuron 43, 605–608. Wenk, G. L. (2003). Neuropathologic changes in Alzheimer’s disease. J. Clin. Psychiatry 64(Suppl. 9), 7–10. Yang, T., Wang, L., Zhu, M., Zhang, L., and Yan, L. (2015). Properties and molecular mechanisms of resveratrol: a review. Pharmazie 70, 501–506. Copyright © 2018 Andrade, Ramalho, Pereira and Loureiro. This is an open-access article distributed under the terms of the Creative Commons Attribution License (CC BY). The use, distribution or reproduction in other forums is permitted, provided the original author(s) and the copyright owner(s) are credited and that the original publication in this journal is cited, in accordance with accepted academic practice. No use, distribution or reproduction is permitted which does not comply with these terms.